After a dry Halloween, rain will return to the forecast for the rest of the week. Milder temperatures are on the way as well. Today and Tonight: Halloween will bring mostly sunny skies and seasonable temperatures. Expect high temperatures in the mid to upper 70s with south winds of 5-10mph. Much better weather is on tap today compared to previous Halloweens. 2016 was the warmest on record, topping out at 88 degrees. In 2015, it was the wettest on record as over 4 inches of rain fell. For this evening, skies may show a few clouds but no rain is expected and temperatures will fall from the low 70s to upper 60s. Some clouds and fog will be possible overnight with light south winds and low temperatures in the upper 50s. 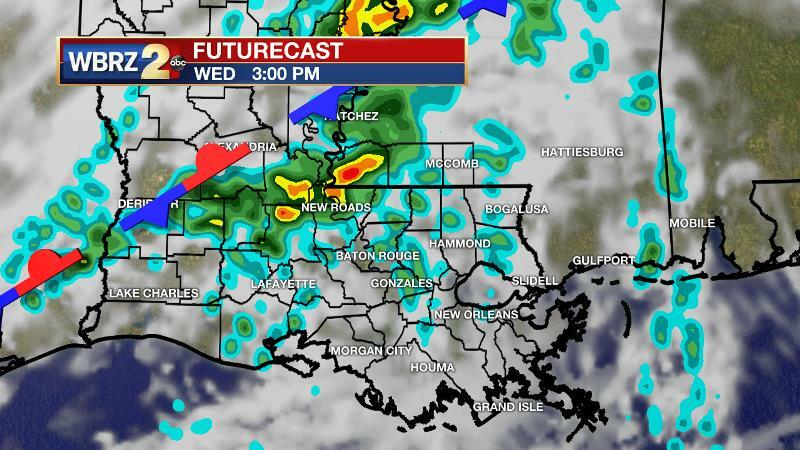 Up Next: By Wednesday, expect mostly cloudy skies across the WBRZ Weather forecast area and scattered showers and thunderstorms are expected to begin by afternoon. Off and on bouts of showers and thunderstorms are then anticipated through the end of the week. It will not rain constantly, and while measurable rain is expected everywhere by Friday, amounts will be light over the three day stretch with 1 to 2 inches possible. The most likely areas to achieve those higher amounts are north and west of Baton Rouge, closer to where a front and upper level disturbance will stall. In addition to the unsettled weather, thermometers will make a push back toward and eventually above average. 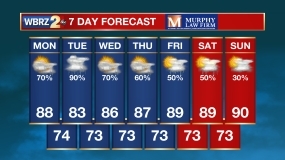 The forecast is trending drier for the weekend. Highs will be in the low 80 with lows in the low to mid 60s through Sunday. If you are in search of the next front and subsequent cool down, the earliest possibility looks to be the end of next week. The Tropics: A non-tropical low in the north central Atlantic could develop slowly this week as it drifts in the open waters and poses no threat to land. The final month of the official hurricane season begins tomorrow. While mainly zonal flow will continue in the upper levels, a slow-moving front will approach on Tuesday and then stall well away from the local area, due in part to that zonal upper flow. The front will draw moisture northward and this will interact with a broad longwave trough in the jet stream to cause lift and rain development through Friday. A few embedded waves of energy may enhance activity at times. AT this point, forecast models are timing these upper level impulses for Wednesday morning, Wednesday evening, Thursday night and possibly Friday. Rain coverage and amounts will be highest for areas north and west of Baton Rouge and lowest south and east. Up to an inch or two is possible over the three day period. An upper level ridge and drying atmosphere should lead to lower rain chances by the weekend.